LinkedIn is a strong personal branding marketing tool and is the world’s largest professional network with 450 million users (April 2016). Of those with accounts, a reported 100 million users will access it monthly – read Marketing: 96 Amazing Social Media Statistics and Facts for 2016 for more statistics. Having a solid LinkedIn account is a ‘no-brainer’ and will help you with personal branding, career opportunities and ultimately career progression. Here are a few simple tips, that are not too time consuming and that can help you ‘supercharge’ your profile. Make your profile visually appealing! Most people like to think they don’t judge a book by it’s cover, but in actual fact we do (whether subliminally or not). Use a professional looking photo for your profile. i.e. not a selfie or a cropped photo from a night out, even if it is a lovely photo. Choose a cover photo that reflects you. This could relate back to your business, could be you in action in your profession, or a nice scenic photo – just make sure it’s relevant to you. Create a personalised URL and include this URL on any CVs when applying for a new job so that your LinkedIn profile is easy to find. Populate your contact information so that it is easier to find you across social media email, mobile and your website. Alan Cheesley, Flow Online Managing Director, profile on Linkedin. We have very short attention spans, even shorter than goldfish, as the Telegraph stated earlier this year, therefore the KISS rule (Keep It Simple Stupid) is now more relevant than ever. Keep content short, to the point, easy-to-read and where possible visual (videos, photos, presentations). Short, succinct and easy to digest. Only include the important need-to-know information; such as what you do/would like to do, your skills, achievements and what you bring to the business. If you can make it visual, do so. If you are a creative producer showcase some of your best creative work. If you are a course provider, lecturer or educator; engage with your contacts by talking about what you do, this will also show them your presentation skills. Tell people a bit more about yourself, give yourself a personality by completing the sections relating to languages spoken, volunteering and charitable involvement or what organisations you belonged to at university. Title, dates of employment, a sentence or two with your key responsibilities and achievements. Make sure the company information is correct so that it links through to the company LinkedIn Page. You can also highlight specific examples relevant to that business here. For example, if you are a marketing manager you may like to upload post campaign video analysis here from a successful campaign or if you are a builder you could show some before and after photos from a recent project. A visual endorsement from a client speaks volumes and has higher engagement for those reviewing your account. 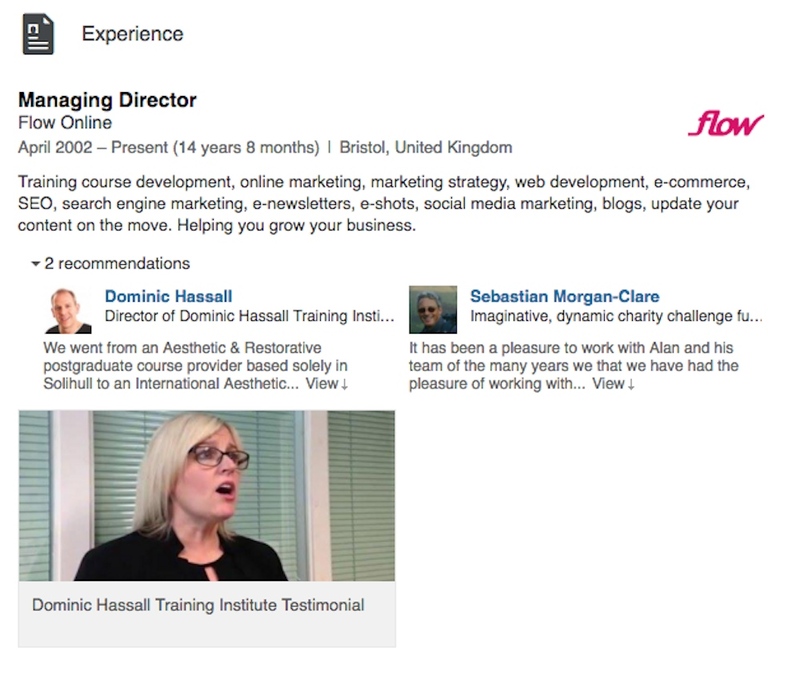 Dominc Hassall, Professor of restorative and aesthetic dentistry, experience summary on Linkedin. This is a very important section that can often be overlooked when setting up a profile. This section is where you can choose which ‘skills’ you want to be acknowledged for and also choose the order based on importance and relevance to you. You can have up to 50 skills and the ‘Top 10’ are identified on your profile page. Go ahead and showcase your skills for all of your contacts to see. Remember that LinkedIn is a social media channel, therefore it’s important to understand that it’s not just a one-way conversation only telling people who you are; it is also an opportunity to engage with other people, businesses and ideas. Whether you choose to be an active participant or follow from the sidelines LinkedIn has the accessibility to easily follow influencers, news and companies; not too dissimilar to how you would follow these accounts on other social media such as Facebook and Twitter. The LinkedIn groups functionality allows users to engage with a community of people who have an interest or stake in a specific topic or subject. When we are looking for something new; whether a car, a holiday or a hairdresser recommendations speak volumes and stand out from the crowd. The same applies for your LinkedIn profile. Whether the person giving you this review is a past employer, employee or client this recommendation offers people viewing your profile a real-time reference and could be the difference between an offer of employment or business opportunity. Take action now by reaching out to some of your business contacts and asking for a recommendation. In 2014 LinkedIn recognised the importance of being able to showcase your projects, ideas and research presentations as part of a person’s professional identity and subsequently users can now upload their published SlideShare presentations directly to their profile. 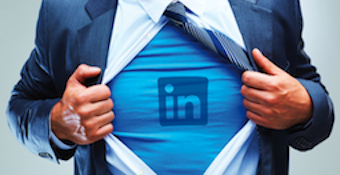 I hope this has inspired you to take action and make some simple but powerful changes to supercharge your LinkedIn profile.